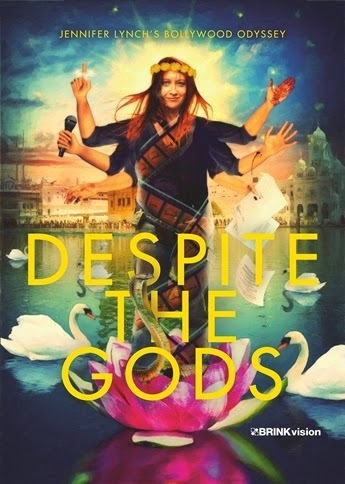 Plot: Cinema's prodigal daughter Jennifer Lynch braves the unmapped territory of Bollywood-Hollywood movie making, where chaos is the process and filmmaking doubles as a crash course in acceptance and self-realization. First off if you know me I love a good documentary, the more reality that builds in the process of the film, the better the subject unfolds. What a perfect documentary. Simple put, a great film. I don’t mean that in a light hearted way, or just a matter of fact setup. I truly mean this is something unique, fresh and absolutely mesmerizing. A true gem in the film world. Penny Vozniak aced the reality of creating a memorable piece of cinema that lingers in the emotional department of the watcher. Jennifer Lynch, daughter to the master David Lynch is chronicled in this behind the scenes style film. Jennifer went to India to direct her new film HISSS. There over the period of creating the film, she slowly, through one obstacle after another, loses her grip and sanity while being filmed, equal parts comical, and equal parts frustration. This is truly a modern classic. This is a landmark film on the exploration of directing a film, yet also the personal hardships, struggle, and comical undertaking of creating a film while balancing, being a mother, and life's problems, which are always up's and downs. This is priceless documentary that is a must see, must own, and must be experienced. I felt deeply enthralled with this film. I love the personal reality of the documentary. This is a film that will remain in my conscience as a thought provoking and powerful teaching tool on the horrors and wonders of film making. Brinkvision has brought this powerful piece of cinema to DVD and I highly recommend it. It’s one of the greatest examples of film. This is a modern classic. I loved everything about this film. If there is one thing I can express, this needs to be seen. Brinkvision did a wonderful job bringing this film out. A true trip. Possibly the best example of what it’s like to make a film, while struggling with life’s obstacles. This is real, feels real and becomes real as you watch. All those who love film as an art form, and an important part of life, has to see this film. This is a modern classic, lovingly mastered by first time film director Penny Vozniak. Penny created magic. Jennifer Lynch created the art form of making a film, and allowing everyone to see the ultimate madness behind the camera. Nothing more needs to be said other than, masterpiece.